Last week I returned from the National Archives in DC, and over the weekend I attended and was one of the speakers for the 150th Whitestone Hill observances not too far south of Kulm, in Dickey County, southeastern North Dakota. There has been much said about Whitestone Hill (it is a piece of genocide in American history), and much more to be said too. I have a forthcoming article in The Public Historian (“Imagining a Battle at a Civil War Mistake: The Public History of Whitestone Hill, 1863-2013” Vol. 35, No. 3, August 2013) that concerns the remembrance of this site, and this induced me to note, at least to myself, how history is never final. During the August 24, 2013 day of observances, I took some notes, photos, and video. Here is a link to the line-up. I thought I’d share some more notes from the day here, but they are not exhaustive (I tried to scribble when I could). Kevin Locke opened the observances around 9:00AM with a Native prayer, and he spoke to the temporality of life. He described this in Dakota and Lakota language, and also noted a word that defined something that was fleeting, a philosophical universal of life. Also, the essence of the word “Dakota” means peace, ally, friend. Under the tent, the morning at Whitestone Hill. Ladonna is speaking at left. Also: Frogs were everywhere at the site that morning. With every couple steps, a couple little jumps would happen in the grass below. Upon closer inspection, you could see the little frogs. This, of course, provided untold of amusement for youngsters and biologists, and basically any of us city types who don’t regularly get to see frogs in this kind of battalion strength. I caught up with a good friend, Dakota Goodhouse, and he said he arrived a little late because his son asked him to have breakfast. Note: having breakfast with your son is a good idea, especially if your son wants to. One of the coolest things ever, especially at these sites and on our northern Great Plains, is coming upon a tipi. Even better, coming upon more than one tipi. And even better-better, coming upon one tipi, and the raising of another. Here is a short video of that. There is a charcoal marker on the top of the last tipi pole, the one where the canvas is fixed to and hoisted up (in pre-canvas days, before Euro-American industrialization nearly wiped out every last bison, these bison hides would be used). 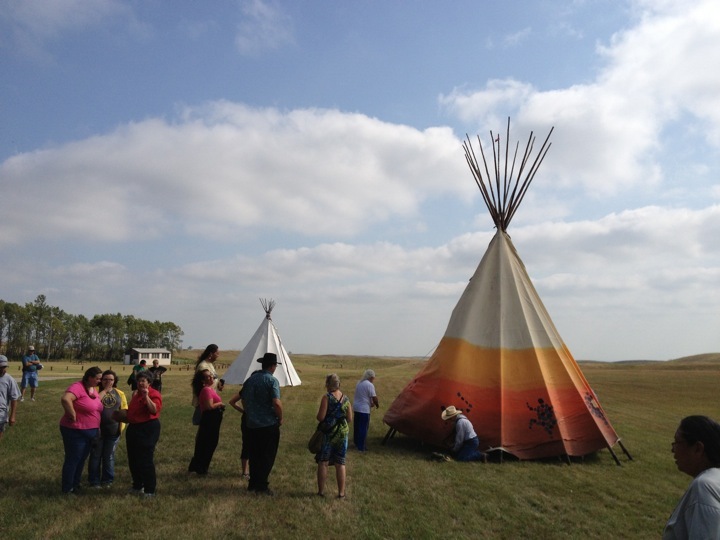 Notice the kind of community that simply “happens” with the raising of a tipi. It’s akin to the pre-Industrial raising of a barn, or relocating a Mongolian ger from one pasture to the next: everyone gets involved, either directly or in supportive spirit. There are smiles everywhere as well. Architecturally the tipi is so fascinating because its verticality rises right out of the horizontal landscape that is the Great Plains. It gets your attention for sure. The new east-facing elevation of the State Historical Society of North Dakota has a brilliant entryway with, impressionistically, a tipi-looking piece of modern art. I think it is excellent. Tipis at Whitestone Hill, August 24, 2013. Note the verticality in contrast to the horizontal landscape of the Great Plains. Everyone should raise more tipis. 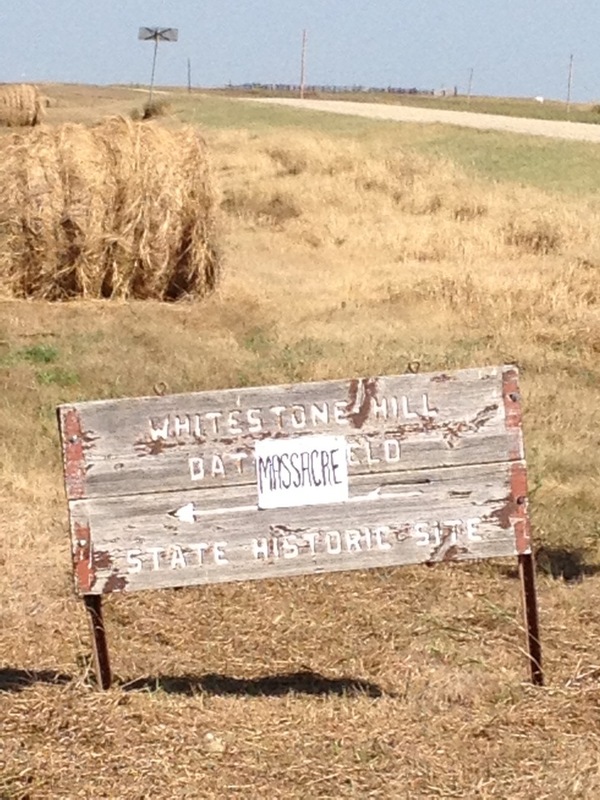 Understandable resistance to the name of Whitestone Hill as a “battlefield.” Photo from August 24, 2013. This entry was posted on Monday, August 26th, 2013 at 9:21 am	and tagged with Alfred Sully, Dakota, Great Plains History, Lakota, North Dakota, Tipi, Whitestone Hill and posted in Uncategorized. You can follow any responses to this entry through the RSS 2.0 feed. Nice photo of the sign!